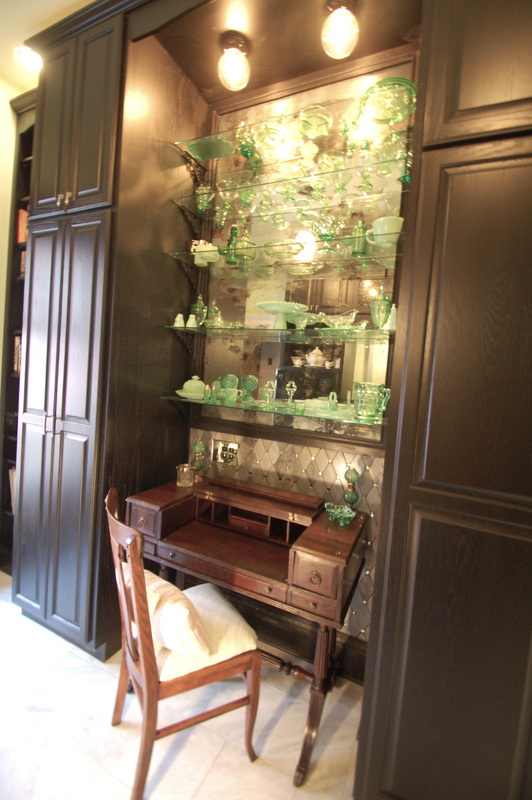 When we finished the antiqued mirror display project in the Butler’s Pantry, the bottom half of the wall just couldn’t compete. It was like choosing a gorgeous, hand-beaded and sequined top to wear for a special occasion, and pairing it with cut-off jean shorts and flip-flops. It just didn’t work together. And, let’s be honest, you probably don’t want to be around someone when they are making that sort of fashion choice. Side note – do you remember Fashion Plates? This space completely reminds me of a home decor version of fashion plates, where you purposely put two wrong things together JUST BECAUSE YOU CAN. 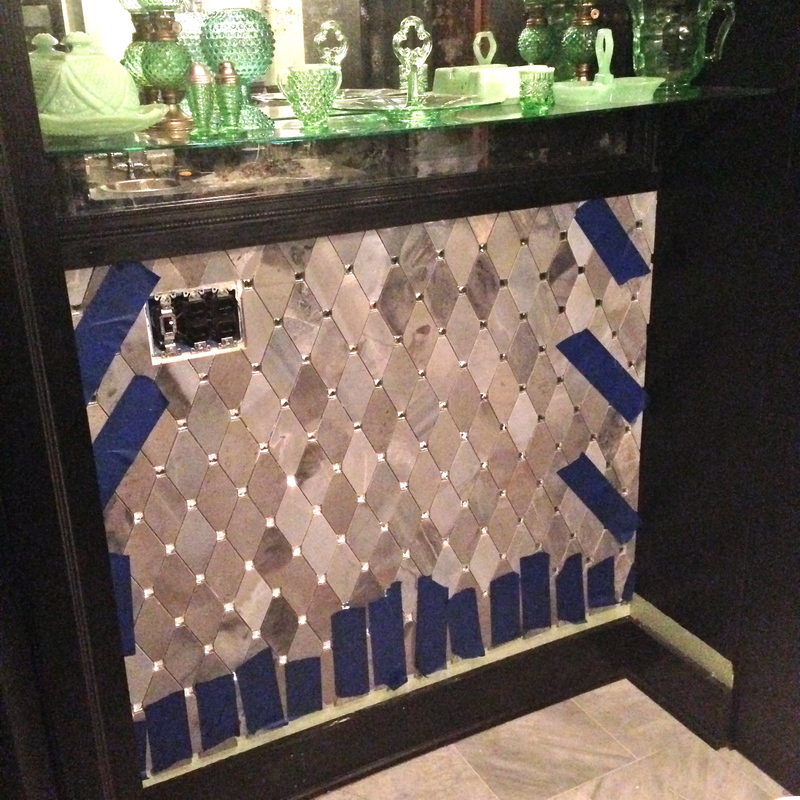 It’s from The Tile Bar, and made of Marble, Moonstone, and Mirror. 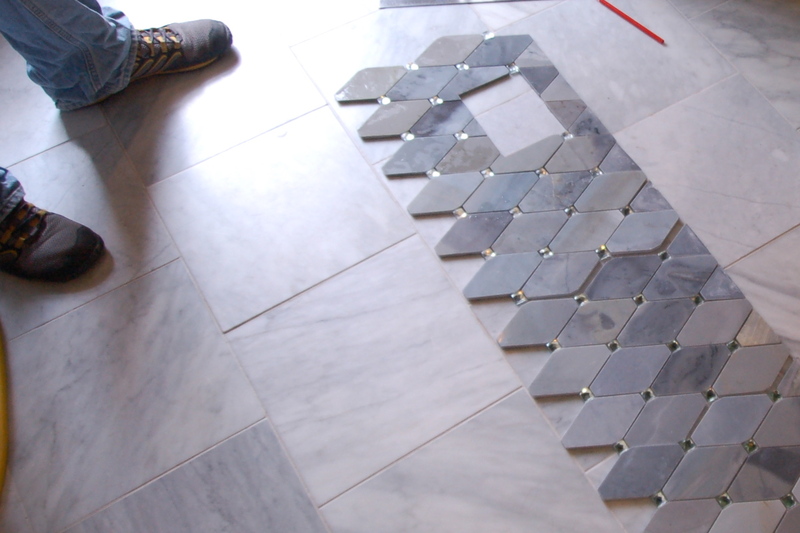 I ordered a few samples from them, because this is the ideal space to use a fancy tile that you might not normally splurge on – and they have a lot of those. 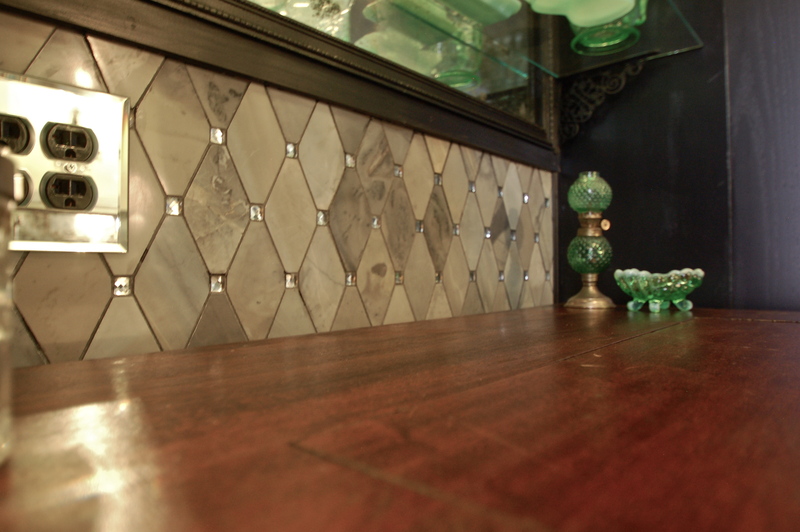 Their tiles edge towards too modern for this historic home, but they are pretty phenomenal. 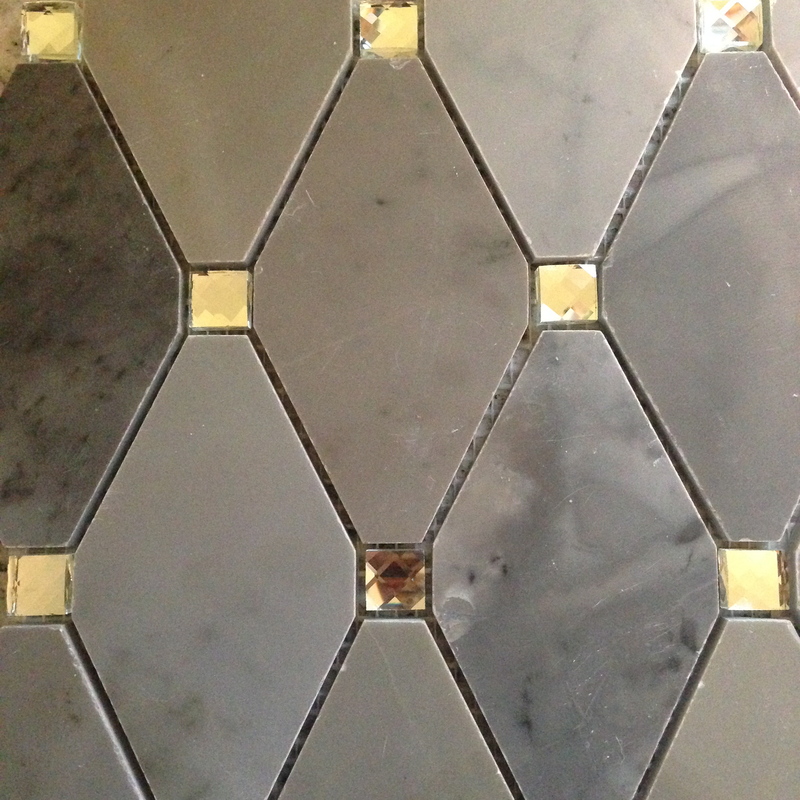 If I were restoring something more modern, I would want it all (including THIS AMAZING TILE). 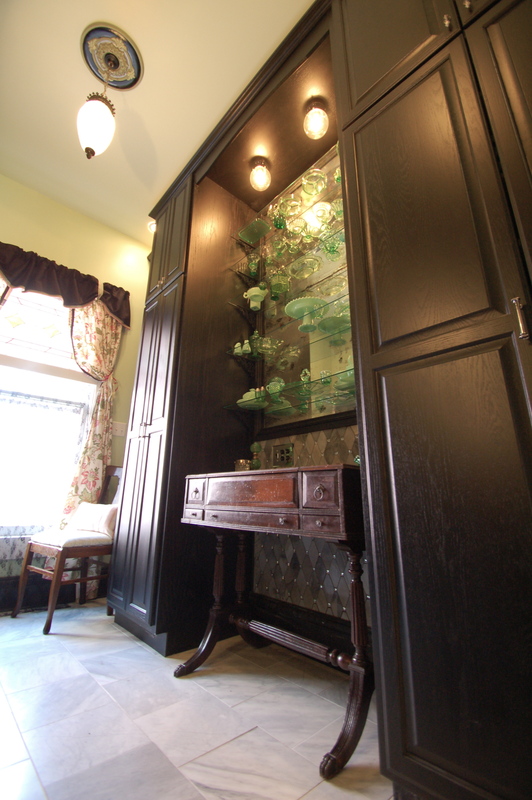 But they do have some breath-taking options that would look great in a Victorian. 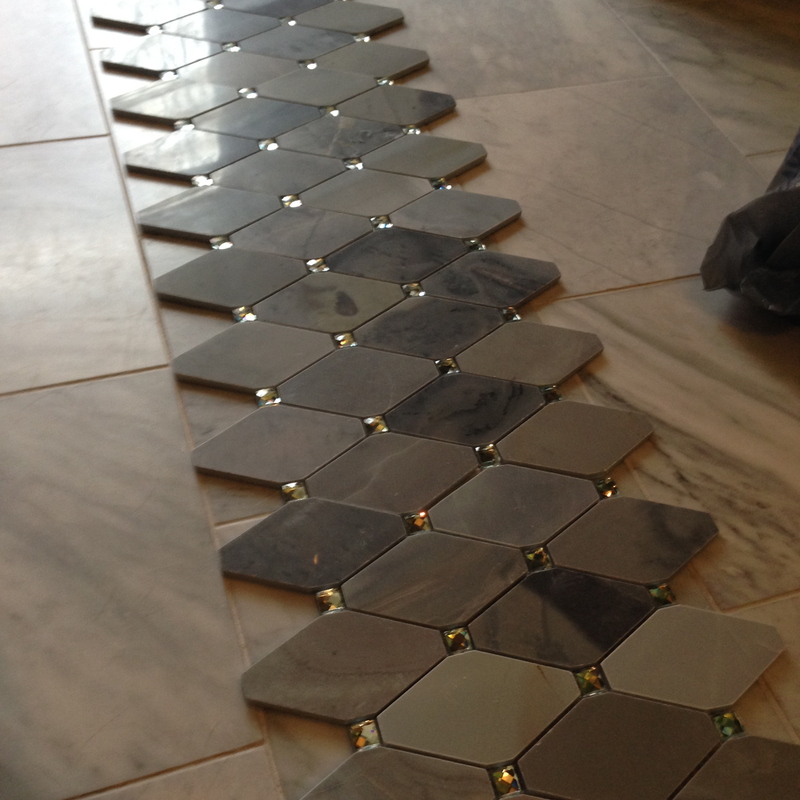 Since we are tiling such a small space, we wanted to make a great impact and this was perfect. 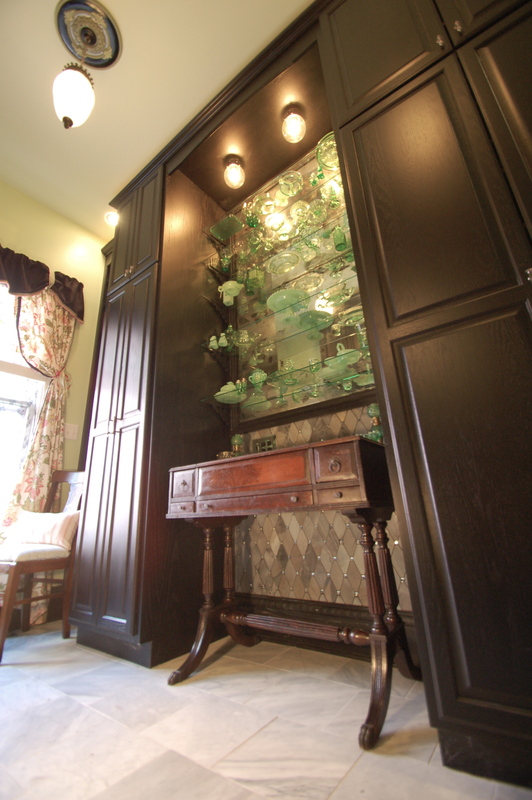 We loved the colors, and how the mirrored squares would coordinate with the antiqued mirror. 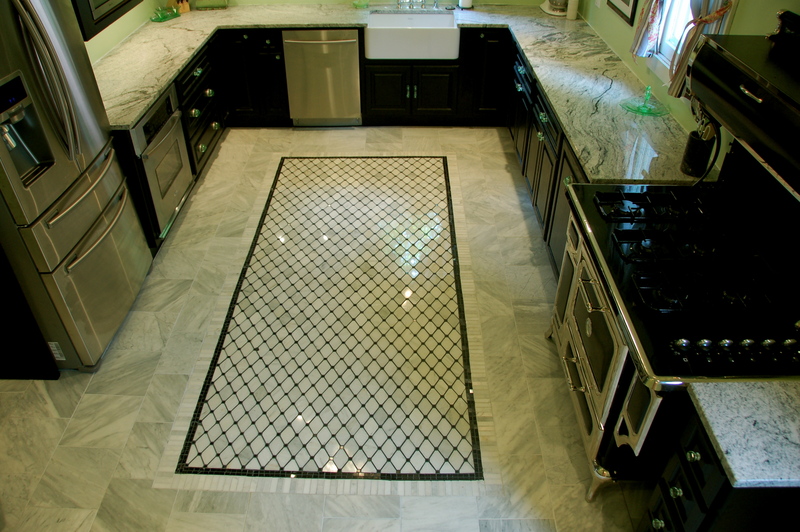 Also, it was hard to pass up a tile that was the same pattern – albeit slightly larger – as the inlay in the kitchen. 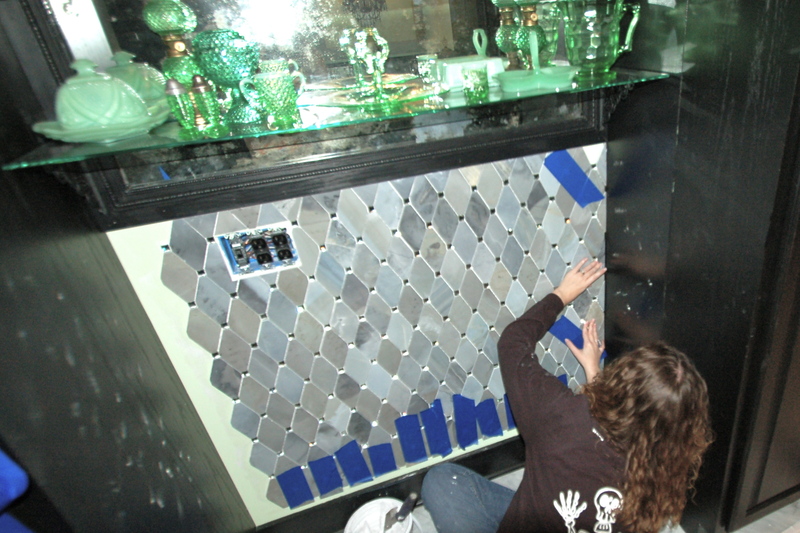 Not only that, but it’s REALLY sparkly with the faceted mirrored squares. 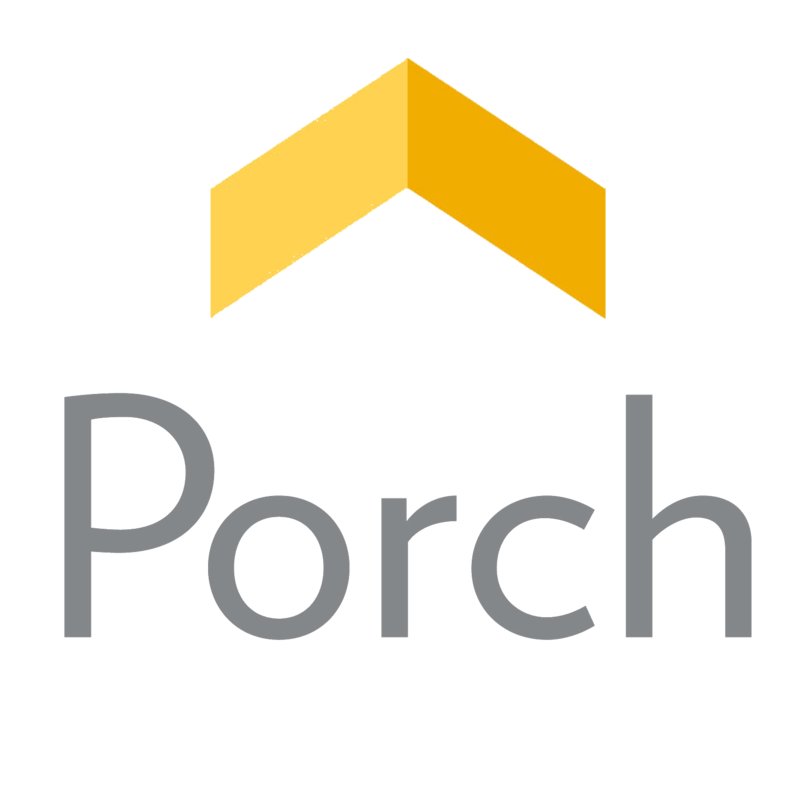 I also decided we were going to do this project during snow. 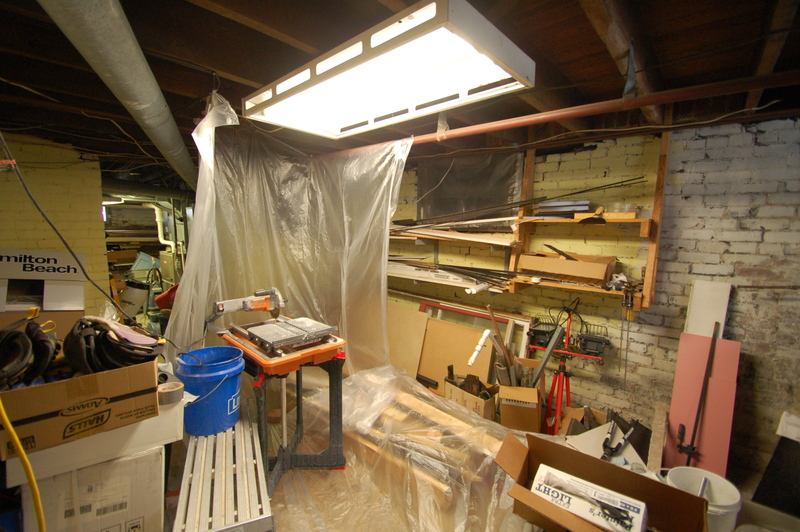 And remember, we sadly don’t have a shop or a garage, so if we can’t be outdoors, we have to be in the basement, or in one of the rooms yet-to-be-restored. 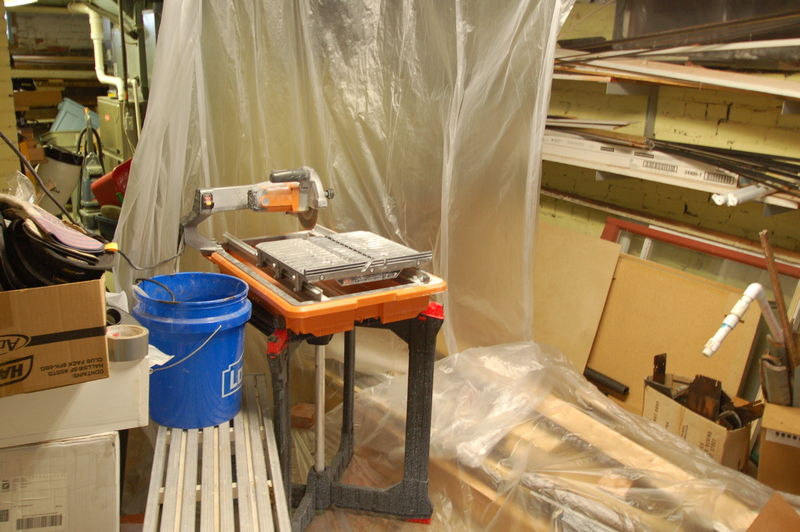 Since the wetsaw can be messy, Doug MacGuyvered this tent in the basement for the wetsaw. We started with the hardest cut first – the outlet. 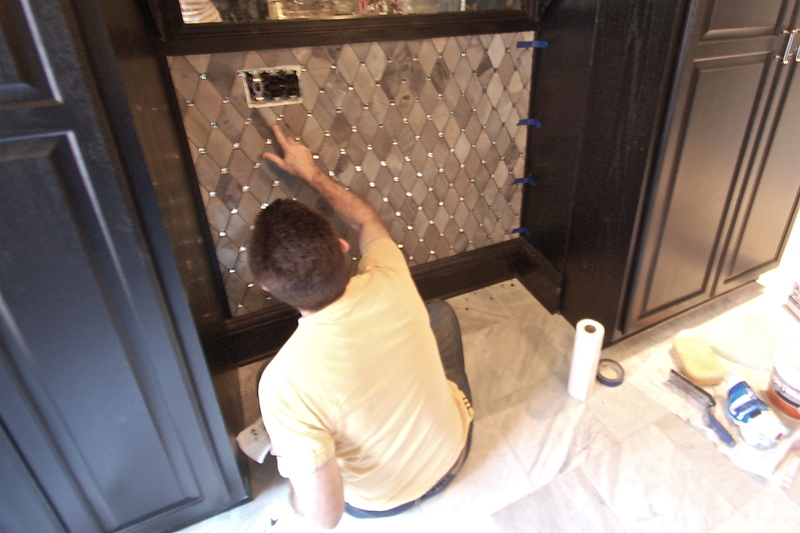 I love tiling – mostly I love the design, but I love cutting and installing it, as well. What I’m not as good at is the measuring and making super accurate and really crazy cuts like this. Luckily, the guy I married is pretty stellar at that part of it! Whew. We started at the top, to make sure it was going to be level, and laid all the field tile the first night. 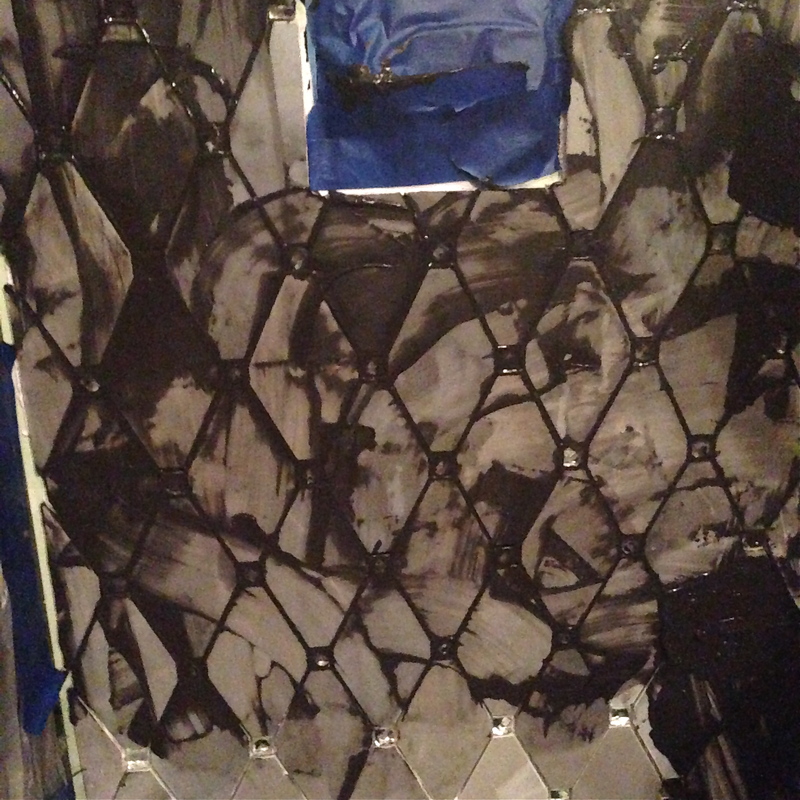 Painter’s tape held the tile in place while the mastic dried. 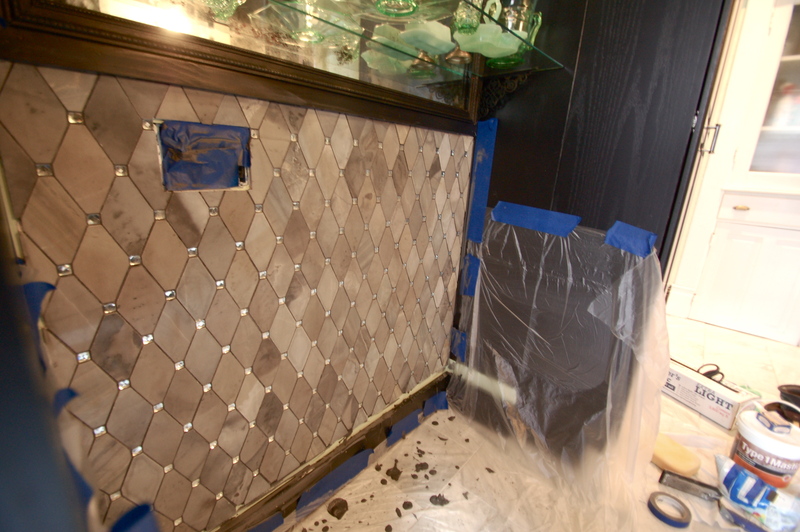 If you’re tiling in an area that isn’t going to see any water (like this) it’s totally fine to tile over drywall. Just sand and prep the area. I just wanted to point that out, in case anyone is having a heart attack that we’ve lost our minds, I promise, we’re okay. Mostly. 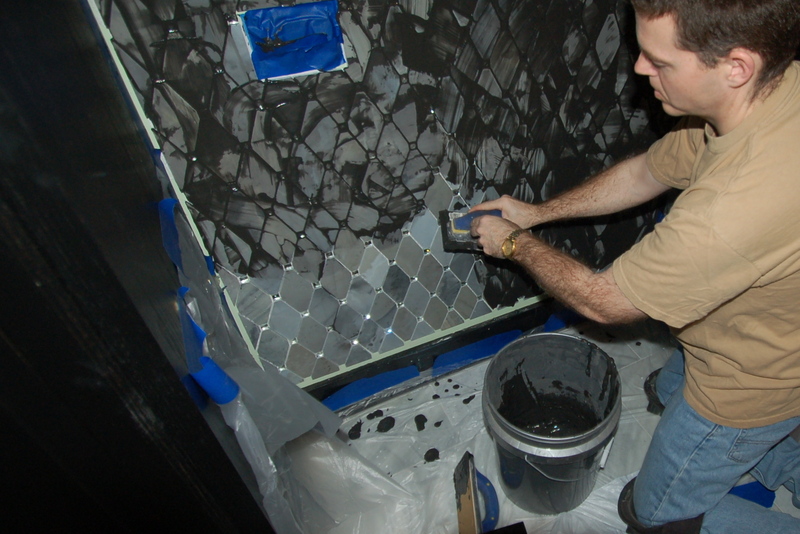 That’s also the rationale for using mastic instead of thinset. First night, done! We only really did about an hour a night, after dinner and before bedtime. I just love the variations of light to black. 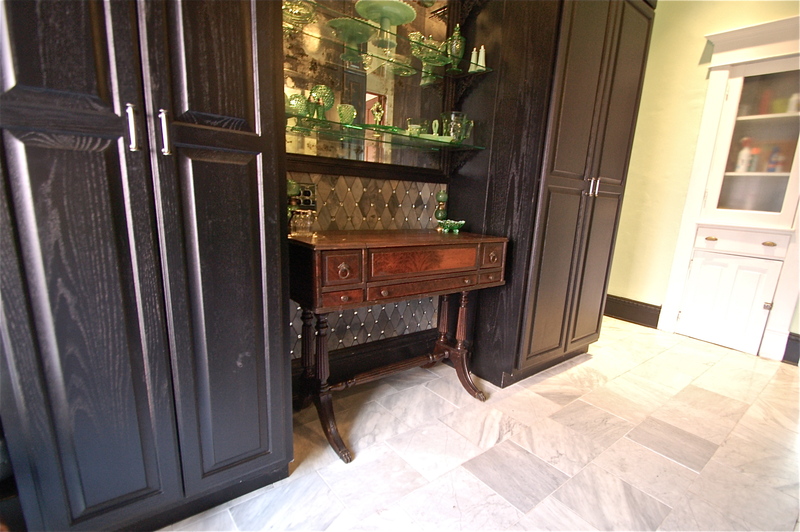 It really makes the transition from the light white / gray of the marble floor, to the mirror above, and to the black cabinets next to them. 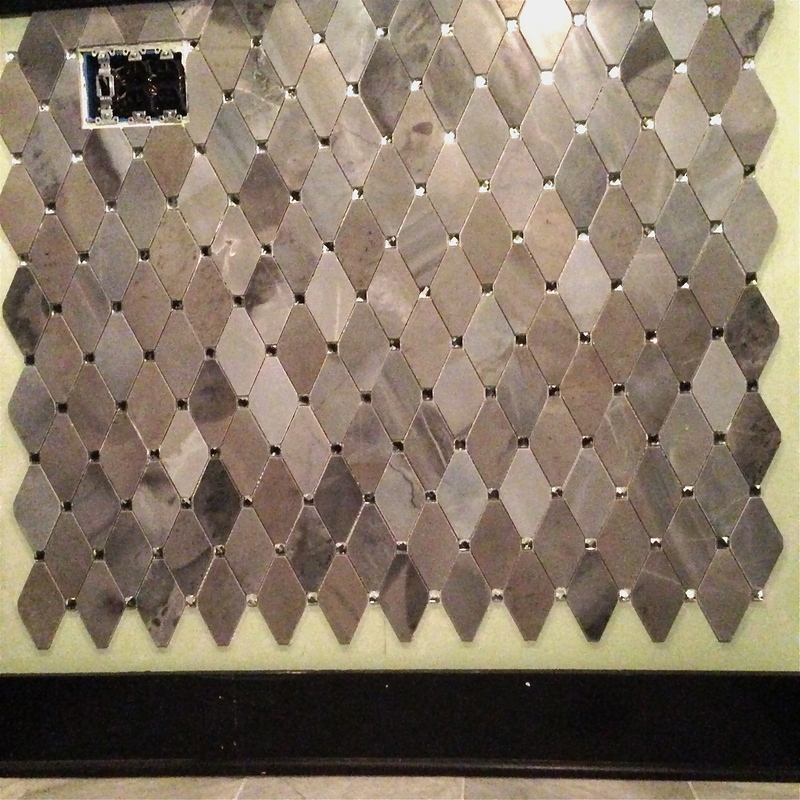 The second night, we cut and installed all of the edge pieces. It was really good timing – Doug did the cutting, and I installed, and neither of us were ever waiting on the the other. 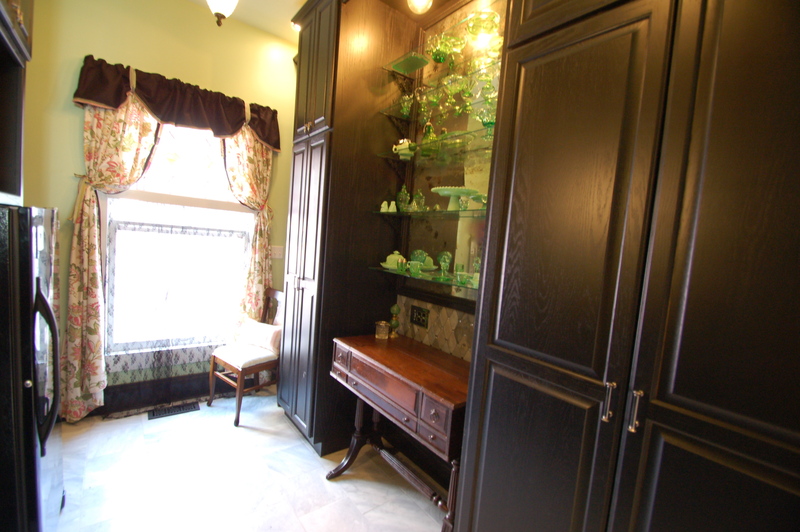 In this picture below, see all the white dots on the cabinetry, especially to the left? That is light, reflecting from the mirror on the tile. 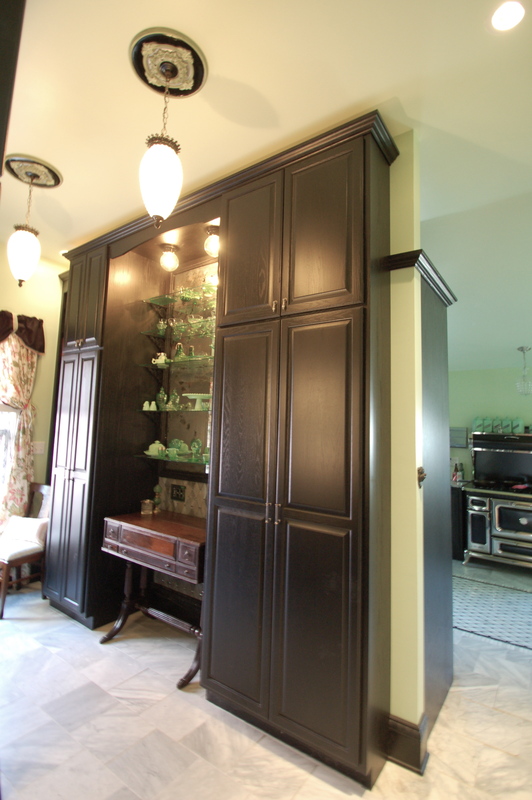 I am one step away from hosting a disco in my Butler’s Pantry!!!! 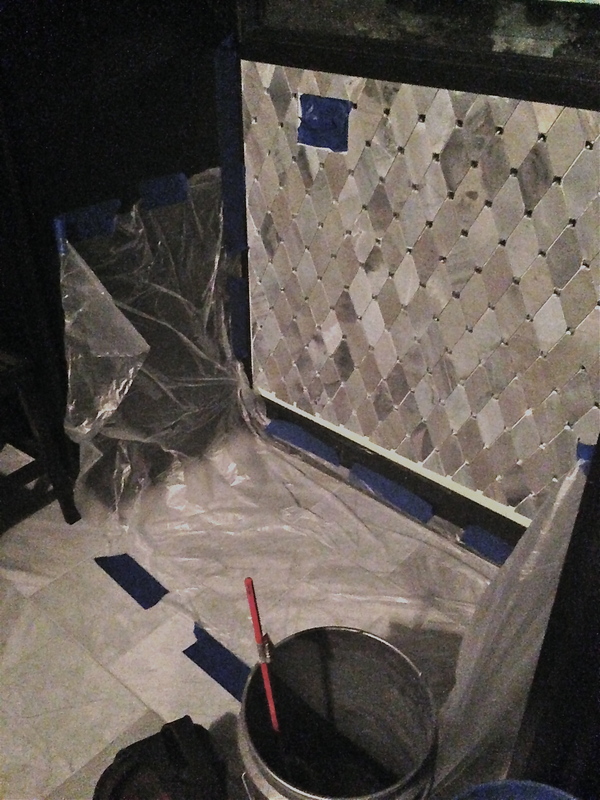 Next, we prepped for grout. 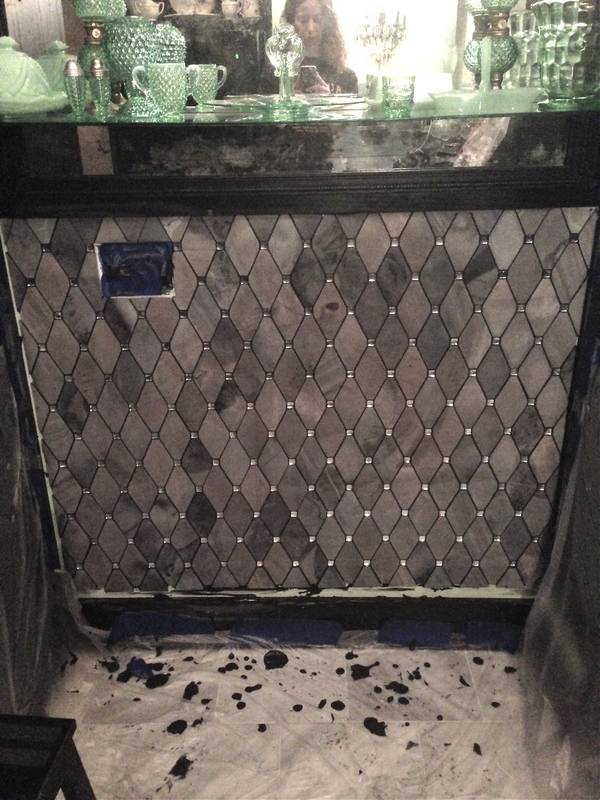 Grouting is so fun and messy. 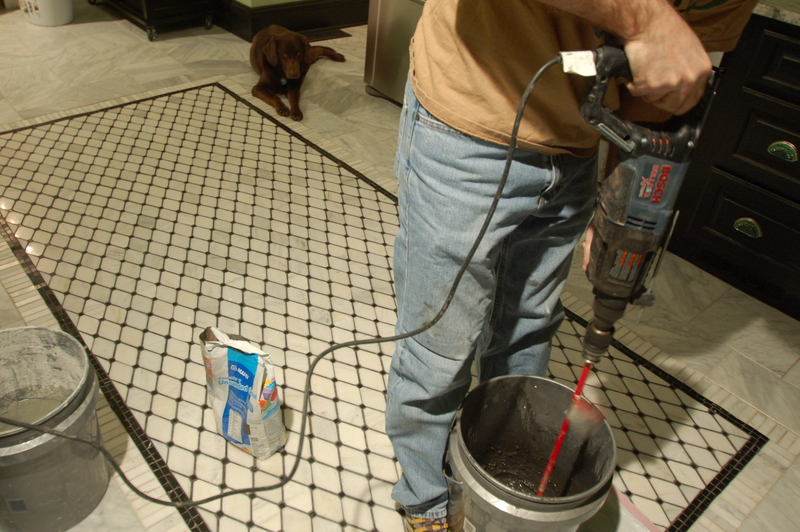 Reese wanted to supervise that we were properly mixing the grout…. from far, far away. 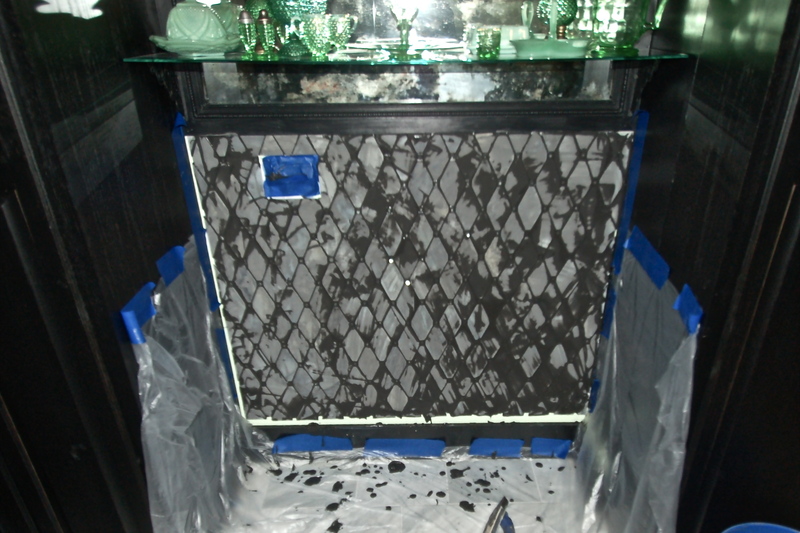 Black grout is always the best idea, except when you are actually doing it, and then it’s the worst idea, until you’re done with it, and then it’s the best idea again. To be honest, this texture is pretty awesome to look at. It’s a pretty cool art installation. 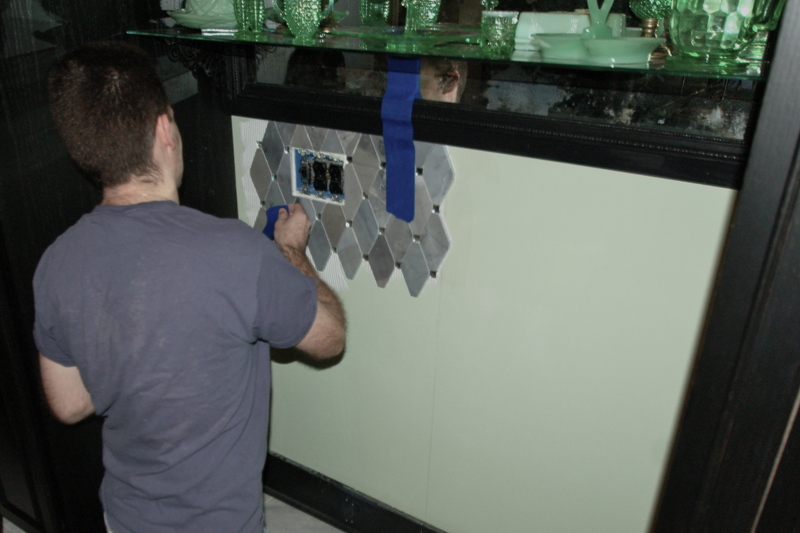 We put the moulding back up, and then had to touch up a few grout places. 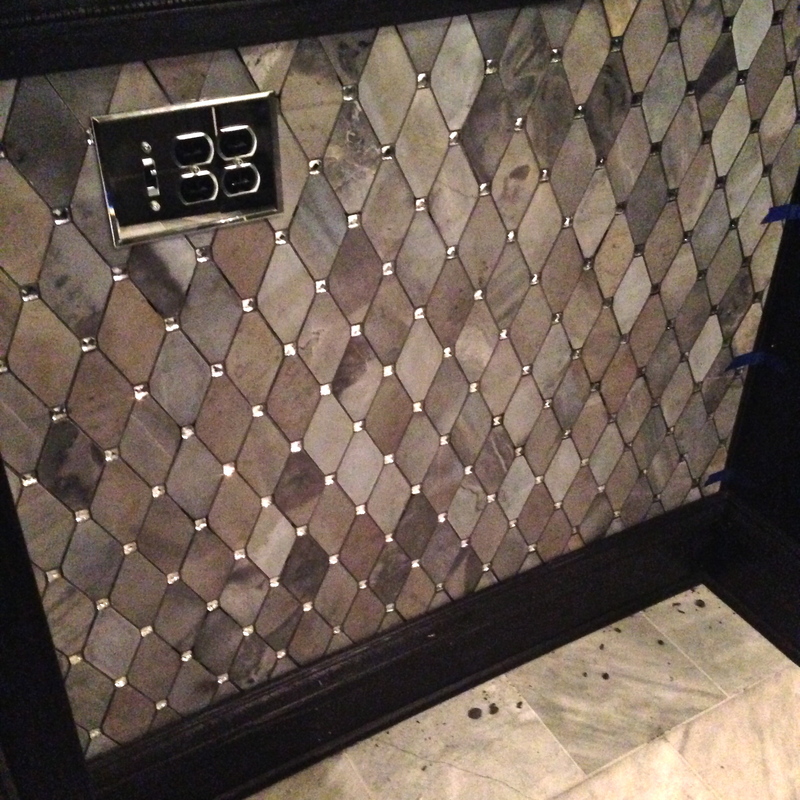 And, of course, added a mirrored switchplate cover. 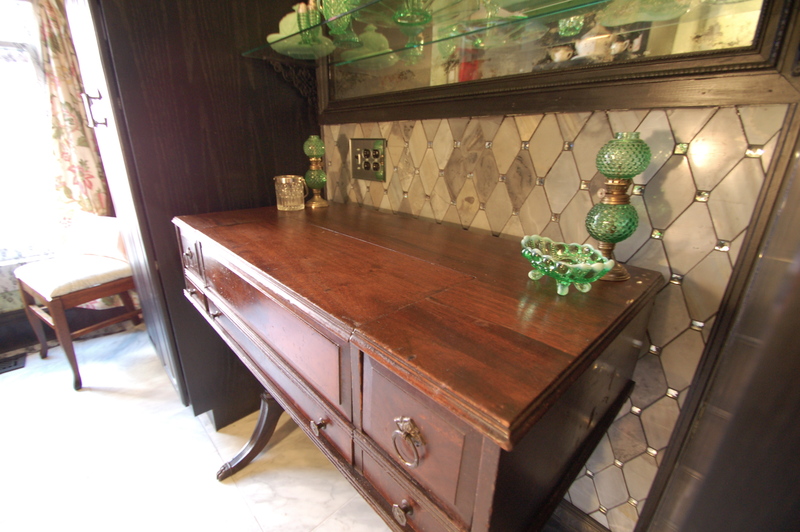 Remember this darling desk that I restored? 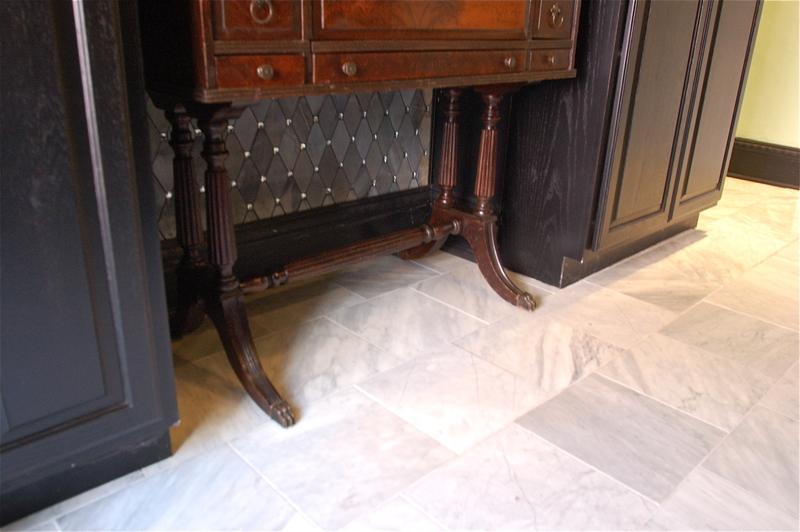 We bought it for that space, knowing that we wanted something leggy, to show off the tile. I am so glad this project took this unexpected turn. If you loved the rolling island that used to be here, never fear. 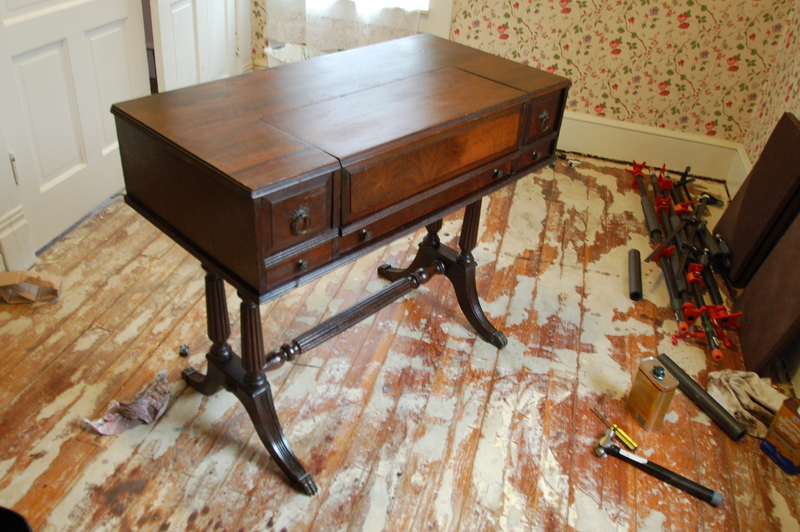 It’s going to undergo a makeover, too, and end up in the kitchen! Stay tuned. What drew us to the desk when we spied it on Craigslist were the legs. Absolutely our favorite part – and the fact that the dimensions are perfect doesn’t hurt either. This fulfills my ONLY rule that I think should be universal with design for everyone : Every room you have should make you smile when you walk into it. 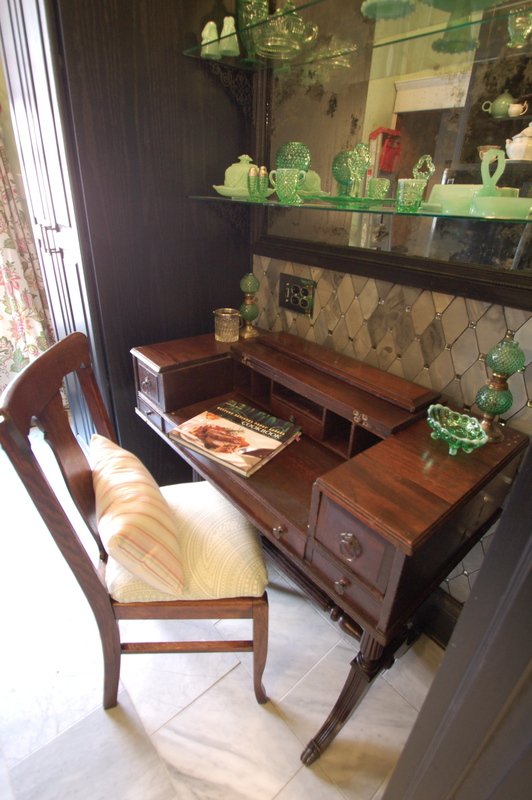 With the desk open, and the newly restored chair. Seriously, my plan is to start using this spot to write grocery lists, plan menus, and plan dinner parties. Already so inspiring. Another project – a small one, anyway – complete! I hope you love it! You are so very nice! I’m glad you like it! A show would be so fun, but I’m glad I have this outlet to show people our progress. 😊 Thank you for always cheering me on, Curt! Stunning! I totally understand about smiling at your work when you walk into a room. Every time we complete a project, we catch ourselves for weeks, standing back and admiring our work and how it is all coming together. I also know how certain elements can “speak” to you. You and your home are totally in sync. You and your husband are doing an AMAZING job! I love seeing the progress. Thank you Brenda! I love your comments so much. I think sometimes I get frustrated when people think they shouldn’t paint something light, or dark, or they are afraid to do something they want to do, because it’a not what they “should” do. Rules, schmules! If it makes you happy, do it. Yet another stunner! Love it! Seriously stunning! Wow – I’m so impressed. Really looks great and you did it on your on! Also – love your fashion plates comment – I had those!! I do love it! I also love the idea that you can be so visionary that you can see pieces placed where they should go before you place them. Thank you so much, Linda! You are wonderful! Thank you for an excellent post, it was very interesting and informative. 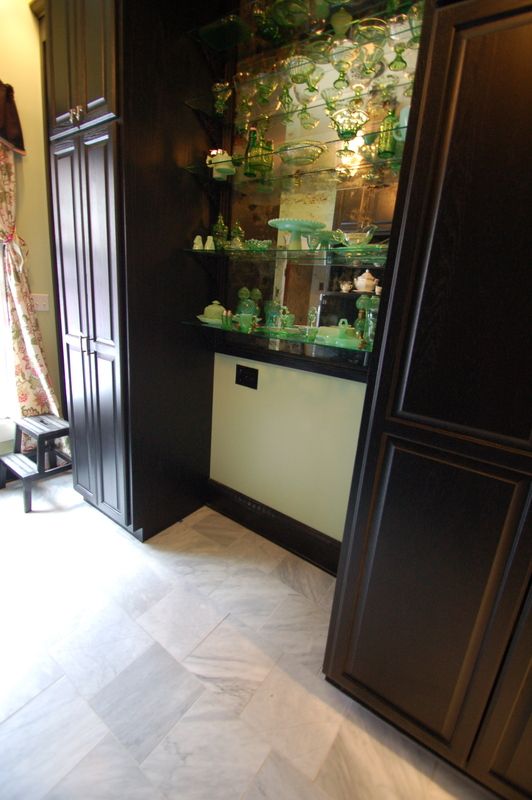 Working with marble is a very difficult and laborious work.